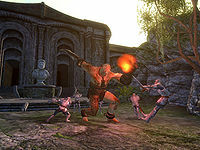 Featured images follow the same nomination process as for Featured Articles, but as they appear in a different section of the main page, a separate series of votes is held to decide which images meet the required standard. 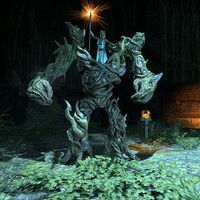 For an image to be eligible for Featured status, it must be used in a UESP article. This is to prevent specially-taken beauty shots from stealing the limelight. A gallery of older Featured Images can be found here. Similarly, the archives of previous nominations can be found here. Note that not all failed nominations are included. Any registered member can nominate any image at any time. Nominated images should be of high quality and meet the site's image standards. To nominate an image, list it on the bottom of this page with a three-tier heading, (===Example===), and briefly explain why you think the image should be given featured status. This is another great image. 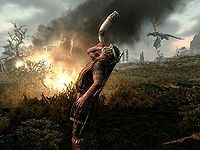 It appears cinematic, which is rare for the TES series. After an image has been nominated, any registered member can vote to support or oppose each nomination. Each member can only vote once for a given image, but a member may change his/her vote by striking out the original vote and replacing it with the revised vote. Commenting with your vote is optional, but if you oppose a nomination, please state how the image must be improved to get your support for featured status. The image has been nominated for more than seven days. Images whose nominations pass will receive featured image status on the front page for two weeks (which may be extended up to one month if there is a shortage of images), and receive a small bronze star ( ) on the top right corner. If an image achieves featured status before the present featured image's time expires, it must wait its turn. 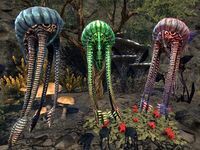 A fantastic closeup of one of the new types of dangerous flora in Murkmire. It's detailed, rich in colour, and makes for a great thumbnail. This is just an excellent shot. It comes off as eerie and forbidding, and the angle is just perfect. 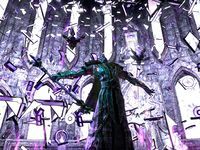 This is a very cool image depicting the antagonist of Murkmire ESO DLC and it comes from the last encounter with her. Since this is basically taken during the fight, it is quite an achievement to manage to take this image. Kassandra is normally hidden inside this miregaunt guardian, so it takes some luck (or patience) to capture her in this cool pose. I should know, because I was there and tried! Besides that, the image also has good quality and sharpness. 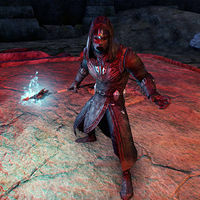 This is definitely one of the more unique ESO images that we have here on UESP. A high-quality screenshot showing all three netch pets together. 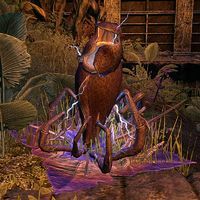 The reason this is significant is because this requires purchasing all of these limited-time Crown Store pets for use as furnishings. 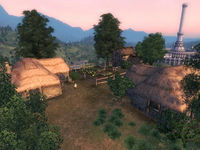 This image resembles the kind of work done in other gamespaces with the use of console manipulation, except here it was done entirely in-game using the furnishing system and cash transactions. It's great to be able to have ESO images like this, and this one is just particularly picturesque. A really cool action shot of the Gatekeeper making short work of the adventurers, having just knocked one of them into the air. 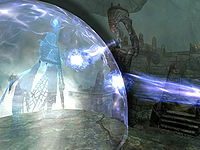 A really nice action shot of the Mad Architect using Obliterate during his boss fight. I like the colour scheme as well as how the image captures all those glass shards in mid flight. Amazing lighting, high graphics settings, excellent framing; this is an excellent action shot of an enemy necromancer. This page was last modified on 13 April 2019, at 03:15.